Dmitry Rogozin: "'Smart power' and 'soft power' are fine words that make sense, but real power – power to be reckoned with – is the physical power of knowing that you can strike with an iron fist." Source: ITAR-TASS. Dmitry Rogozin, Russian deputy prime minister and chairman of the Defense Industry Commission, tells Rossiiskaya Gazeta whether or not private capital will be allowed into top-secret factories and why the Stalin-era experience may prove useful today. Rossiiskaya Gazeta: Developing new weapons is not cheap. There is a widespread view that spending on the military-industrial complex is money down the drain, and that the money could be used to finance real economic development. 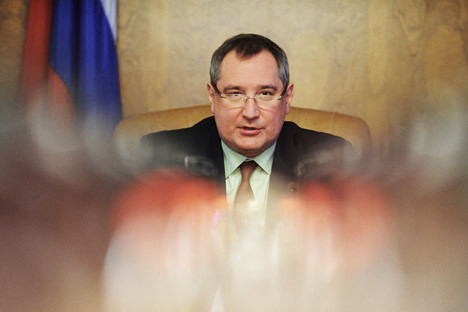 Dmitry Rogozin: Money likes silence. If the country is to develop calmly, it must be absolutely secure in the world. This is our primary task. The second task is to build up the country’s industrial potential and create new jobs. If this is not economics, then what is? RG: What is meant by new industrialization consistent with the 1930s? D.R. : It means creating a new standard of industry. Why along the lines of the 1930s? At the time, we took all the best from the West and adapted it to our conditions. We will probably take a similar path today. Very often it is not about reconstructing existing plants, but about building new plants in new places. Take, for instance, weapons production. Izhmash is a plant big enough to build aircraft carriers, but it produces only Kalashnikovs. To carry out new industrialization – this alone can enable us to develop new weapons – everything should be downsized. All the good things we have must be gathered and concentrated rationally. RG: Should private capital be allowed into the defense industry? Will it be able to work there? One school of thought is that private interests should not be given access to military secrets, by definition. "We can not be happy with NATO as the world's policeman"
D.R. : Yes, you have a dialectical contradiction there – the problem of unity and struggle between opposites. On the one hand, we are very well aware that we will hardly be able to solve the tasks we have set ourselves without the energy of the private sector. On the other hand, clearly there are things and technologies with which only state structures can work in conditions of strict secrecy. Where does a private businessman have a chance? Where there are dual technologies. We are interested in the transfer of technologies from civilian to defense sector, and vice versa. Take, for instance, supersonic technology. We are looking, above all, at high-speed rockets that are practically impossible to shoot down. However, this also gives us a chance to build new-generation passenger planes. There will be hypersonic planes that will fly from Moscow to the Far East in an hour and a half, for example. RG: Are any private companies working in the defense industry? D.R. : There are a few examples. For instance, the RTI Systems (Radio-Technical and Information Systems) outfit is a private joint-stock company. It is deeply integrated in industrial cooperation around building air defense and missile defense systems. This private research enterprise is developing cutting-edge elements of military space defense, and its manager has been awarded a government order. A more down-to-earth (but no less unique) example is the group of private entrepreneurs in Moscow who built a high-precision small arms plant from scratch. They found abandoned buildings, bought them, and bought some of the best foreign technological lines. They hired competent engineers and leading developers of small bore weapons. As a result, they produce excellent hunting and sniper rifles that are, by key characteristics, superior to all of the European rifles. This is truly the 21st century.